The storied and beautifully weathered city of Sofia, one of the oldest cities in Europe, welcomes us to Bulgaria. Riding starts in the northern foothills of the Balkans, alongside the Beli Vit River, before climbing up to the Bogoi Pass en route to the village of Chiflik – where a tasty local plum brandy, or two, awaits. Once over the highest Balkan Mountain pass, the Beklemeto, cruise downhill through the gorgeous forests of the Sredna Gora Mountain and into southern Bulgaria. The sparklingly preserved town of Koprivshtitsa invigorates road-weary legs and sends us on the way across rolling roads to the thermal spa town of Hisarya. For our rest day, we transfer to Plovdiv, "The City of the Seven Hills", where a walk will take us back to antiquity as we discover its Roman amphitheater. A wander along the town's cobblestone streets will lead us to St. Marina Church and an Ottoman Empire mosque. The journey finishes in a flourishing ride through two spectacular gorges en route to Velingrad, the spa capital of Bulgaria. It's Bulgaria at its unspoiled best, a cache of natural beauty and ancient history, comfortable accommodations, and fresh cuisine in idyllic surroundings! Read more about what you'll see on the tour on the SpiceRoads blog. 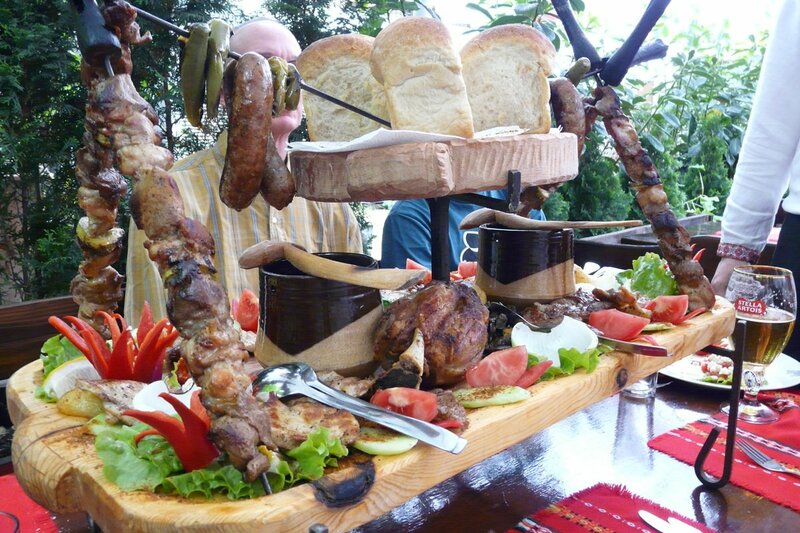 After airport pick-up and hotel check-in, enjoy a welcome dinner in a traditional Bulgarian restaurant. We start point in the north foothills of the Balkan mountains, winding upwards to the small village of Malak Izvor and on to the picturesque Glozhene Monastery. An undulating afternoon takes us alongside the Beli Vit River to the charming mountain village of Ribaritsa. We climb from Ribaritsa to the Bogoi pass, a challenging 12-km ascent. An easier afternoon takes us on a long descent through small Arcadian villages and picturesque countryside. We end the day at a remote spa resort. We start at the top of the highest pass in the Balkan Mountains, Beklemeto Pass, where ruins of an ancient Roman road can still be seen. It's a scenic downhill ride into South Bulgaria and the Valley of Roses. We end at Koprivshtitsa, the best preserved 19th century Bulgarian town studded with characteristic architecture. We visit two famous 'house museums' before we pedal through rolling terrain among the vast meadows. A long descent into Strelcha town passes interesting rock formations, once used by ancient Thracians for sacred rituals, and a 5th-century BC cult temple. After lunch at a local winery, we ride on to the thermal spring town of Hisarya. A day for rest and sightseeing. We drive to Bulgaria's second city and spend the day walking around the well-preserved old quarter with beautiful houses, churches, and narrow paved streets. A spectacular day starts with a visit to Bachkovo Monastery, the country's second largest, and continues with a downhill descent from a ski resort to the village with its many authentic Rhodopean houses. We then ride along the Trigrad River, through a stunning marble rock gorge, and visit the thrilling Devil’s Throat Cave, featuring a 40-m high underground waterfall. We ride back through Trigrad Gorge before a gradual incline takes us up into and through Bulgaria's longest gorge, the 10-km Buinovo. You'll spot entrances to many caves along the way and stop to visit the beautiful 5-story Yagodina cave, filled with fascinating formations. We end our ride at Dospat village, located picturesquely on the shores of a dammed lake. We ride among three beautiful dams, a centuries-old coniferous forest, and vast meadows, finishing in Velingrad, Bulgaria's spa capital . Here you can find over 90 curative and preventative springs and other natural phenomenons, as well as Bulgaria's biggest Karst spring. Relax in the thermal water pools to recover and reflect on a great ride before our farewell dinner. Transfer back to Sofia for your departure or to extend your stay. Day 2 - Yablanitsa - Ribaritsa Village Ride 50km. +840m / -737m. A unique opportunity to meet people, share culture and exercise. Orlon and Kiril were fantastic and entertaining guides and made our trip so memorable. We did so much along the way and their knowledge of places and history was very valuable and informative. The food was amazing and so plentiful. What a beautiful scenic ride. Highly recommend the Bulgarian Highlights bike ride. I will always look back and be so glad I had that wonderful experience. This was an excellent trip. Well organized, great guides, good food, lovely riding.........it exceeded my expectations...liked this trip a bunch! The tour uses roads that are all sealed and have a good surface, some totally new. There are a couple of harder days on the tour, but the support vehicle allows you to do as much cycling as you wish. Choose which bits you want to ride; get a lift to the top of a hill to cycle down the valley if it suits you. Your leader will suggest how you can get the most out of the trip for total enjoyment. We all ride at different speeds, and this varies depending upon how we feel on the day. The guides tend to ride through the group, but stop on the top of passes to regroup. It is not essential that you try and keep up with everyone. Just ride at your own speed and enjoy it. If you are having a bad day, you will be supported. Remember, the vehicle is there for you, always driving behind the group. Suitability: This trip is suitable for anyone with a reasonable fitness level. This trip is not too arduous, but there are climbs every day, so the fitter you are, the more you will enjoy it. Biking Conditions: This tour follows a mixture of good sealed roads. No off-road riding experience is required. A support vehicle is almost always available to help you, and you will always have your guides with you at all times. We will meet you at Sofia airport and transfer you to the hotel. We meet up for a welcome dinner in a traditional Bulgarian restaurant. Today, we transfer from Sofia to start our ride at Yablanitsa town, famous for producing Turkish delight. From the north foothills of the Balkan mountains we slowly wind upwards to the small village of Malak Izvor and on to the picturesque Glozhene Monastery. After lunch, we ride downhill and then on to a rolling road with a gradual ascent bringing us to charming Teteven town. After a short rest in town, we keep on biking upstream alongside the Beli Vit River to our overnight stay in the charming mountain village hideaway of Ribaritsa. A stimulating morning of riding as we ascend from Ribaritsa (630 m) to the highest point for the day – the Bogoi pass (1,185 m). It's a challenging 12-km ascent to the summit, but the riding is through idyllic countryside making for a scenic climb. We have a glorious descent and lunch in a small spa resort set amidst pine trees. We end our ride at the spa town of Chiflik and recommend taking to the warm waters to relax your legs. After breakfast, a short transfer takes us to the highest pass in the Balkan Mountains: the Beklemeto Pass at 1,500 m. This was the ancient Roman Via Trayana (Trajan road), and some Roman remains can still be seen. We make a short ascent to see the Arc of Liberty, symbolizing the liberation of Bulgaria in 1878 from the Ottomans during the Russian-Turkish War, then it's time to freewheel down into South Bulgaria and the Valley of Roses. In May, the fields are blooming, and the petals are picked early in the morning and distilled into rose oil. We take a short off-road section along a stream for some variety. After a picnic lunch next to a river, it's on to Koprivshtitsa, the best preserved 19th century Bulgarian town studded with characteristic architecture and a vivid revolutionary past. After breakfast, we visit two famous 'house museums' to learn more about this Bulgarian town, steeped in literary, political, and philosophical history. We then saddle up and pedal through rolling terrain among the vast meadows that frame this land. A long descent into Strelcha town passes the ''Crooked Beech Tree” and some interesting rock formations once used by ancient Thracians for their sacred rituals. On the way, we visit an ancient Thracian cult temple from the 5th century B.C. and have lunch at a local winery. From here on, the road rolls calmly all the way to our next destination – Hisarya, famous for its thermal springs and Roman ruins. End the day with a relaxing soak. 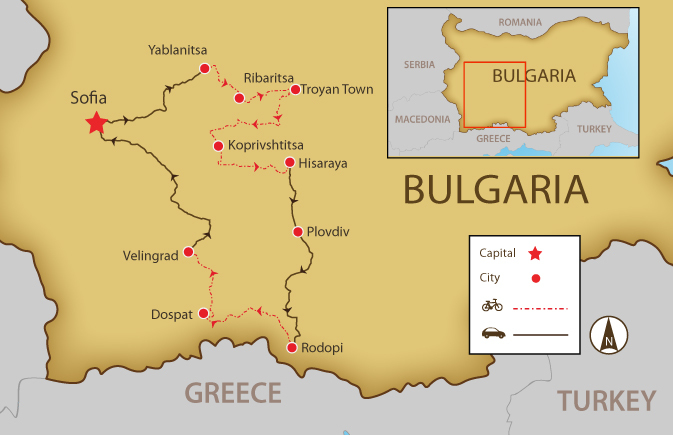 A day for rest and sightseeing as we transfer to Bulgaria's second city – Plovdiv. "The City of the Seven Hills" is one of the world's oldest cities and has a fascinating history incorporating Thracian, Greek, Roman, and Ottoman rule. Plovdiv is among the few cities with two ancient theatres; remains of the medieval walls and towers; Ottoman baths and mosques; a well-preserved old quarter from the National Revival period with beautiful houses, churches, and narrow paved streets. There are numerous museums, art galleries, and cultural institutions. After our lunch, we take a tour of Plovdiv's old town, visiting the Ethnographic Museum and the Ancient Roman Theatre: probably the best-known monument from antiquity in Bulgaria. Our accommodation is in a charming hotel in the old town. An amazing day awaits us! We transfer up to the Pamporovo Ski Resort in the Rodopi Mountains, stopping on the way to visit Bachkovo Monastery, the country's second largest, with its unique 17th century dining room. We jump on our bikes at Pamporovo and ride down to Shiroka Laka, a village with many authentic Rhodopean houses. These two-storey homes feature a small cellar with a hiding place and thick white walls to conceal its courtyard from outsiders. We have lunch in this quaint town before we continue our ride upstream along the Trigrad River and the stunning marble rock gorge it cuts through. Once we reach the famous Rodopi village of Trigrad, we can enter the thrilling Devil’s Throat Cave, featuring a 40-m high underground waterfall. We spend the night at a cozy family hotel and feast on local Rodopi specialties at dinner. Today will be nothing short of spectacular! Back on our bikes for a descent back through the 300-m high walls of the Trigrad Gorge, before a gradual incline takes us up into and through Bulgaria's longest gorge, Buinovo. Known by locals as the The Wolf's Leap, the 10-km long gorge narrows to several metres at some points as the river cuts through the marble rock. You'll spot entrances to many caves along the way, and we'll stop to visit the beautiful 5-story tall Yagodina cave, filled with fascinating formations. We end our ride today at Dospat village located picturesquely on the shores of a dammed lake. We look out onto the dam from our hotel. Today, we ride among three beautiful dams, a centuries-old coniferous forest, and vast meadows, finishing in Velingrad, Bulgaria's spa capital . After riding on so many quiet back-roads, the last 10 km into town are a bit busier than we are used to, so we have the option to transfer, if we wish. There are over 90 curative and preventative springs and another natural phenomenon as well as the Kleptuza, the biggest Karst spring in Bulgaria, with an average discharge of 1,200 litres of ice-cold water per second. Relax in the thermal water pools to recover and reflect on a great ride before our farewell dinner. Transfer back to Sofia for your departure flight or for another night exploring Sofia. Because some people can't imagine going on a trip without their own beloved bicycle, we do not provide them as part of this tour. However, you are able to hire bikes locally for the price listed in the tour pricing section. The bikes are RAM HT2 26ers mountain bikes with lightweight alloy frames, 27-speed SRAM gearing, disc brakes, and front suspension. If you bring your own bike, please make sure it is a mountain bike, preferably with front suspension, and that it is in good mechanical order. Travellers from Australia, the United Kingdom, US, EU and all foreign nationals who have a valid multi–entry Schengen visa, type “C” or “D”, or a valid residence permit in one of the Schengen member states do not need a visa to Bulgaria for a visit of less than 90 days. Click here for the list of countries that are exempt. Please check with the Bulgarian Embassy for further details. No vaccinations are not considered necessary however you may wish to consider cover for Typhoid & Hepatitis A. Fountains in town parks and outside monasteries and churches provide fresh drinkable water as well as the Cheshma (water spouts), found along main roads, which also offer constant supplies of fresh, delicious and safe water. Bulgaria enjoys a temperate climate with hot, dry summers and cold, wet winters, often with heavy snow. Sofia’s climate is generally favourable, with average daytime highs of around 28°C in July and August and 3°C from December to February. Rainfall is highest in the mountains and rural life is often disrupted in winter by huge snowfalls. Southern Bulgaria and the Black Sea coast can be very hot and sunny during mid June to early September. A fleece and long trousers for the evening are recommended. Rain is a possibility, therefore you will need to bring a waterproof jacket and pants. Sun cream is a must, as is a covering for your head. We recommend that you tuck away a few extra euros for possible incidentals that might arise. It is always wise to have some paper currency in case of ATM absence or credit card problems. This will save you a lot of unnecessary worries. It is also customary to tip local tour guides and drivers; however, the amount you give should be dependent on the level of service you receive. The local currency is the lev (plural: leva) ATMs that accept major credit cards can be found in all sizable towns and cities. It’s best to use credit cards as a backup for cash in case an ATM swallows your card - more likely if the card is issued outside Europe. There are many foreign exchange offices in every city and town and at major attractions. The best currencies to take are Euros, GB Pound Sterling and US dollars.